Carl Llewellyn took over as trainer from Mark Pitman at Weathercock House in Lambourn immediately after the 2006 John Smith's Grand National, having combined the roles of assistant trainer to Pitman and jockey since August, 2005. He did not waste any time in bagging a big prize in his new vocation. Less than two weeks after entering the training ranks, Llewellyn celebrated his first success and what a victory it was after 33/1 chance Run For Paddy captured the Scottish Grand National at Ayr, with the trainer also in the saddle for good measure. Born on July 29, 1965, Carl Llewellyn began riding in point-to-points for his father Eryl, a Pembroke farmer. He rode his first winner under rules aboard the Roy Robinson-trained Stargestic in a novice handicap chase at Wolverhampton on March 14, 1986, and was crowned champion conditional jockey in 1988. He had started out aged 19 with Stan Mellor before moving on to ride for Jim Old. He later became stable jockey to Tim Forster and also formed an alliance with Nigel Twiston-Davies that would last the best part of two decades. The first of seven Cheltenham Festival successes came in the 1988 Mildmay Of Flete Chase on board the Mark Wilkinson-trained Smart Tar, and he has subsequently added to that tally with victories in the William Hill Chase (1992 Tipping Tim), Royal & SunAlliance Novices' Hurdle (1993 Gaelstrom & 2004 Fundamentalist), Letheby & Christopher Supreme Novices' Hurdle (1994 Arctic Kinsman), JCB Triumph Hurdle (1998 Upgrade) and Pertemps Final Handicap Hurdle (2000 Rubhahunish), all for Twiston-Davies. Llewellyn landed the biggest jump race of them all, the Grand National at Aintree, in 1992 on board the Nick Gaselee-trained giant Party Politics, who treated the fences with contempt, producing a superb jumping performance and powering to a two and a half length victory over Romany King. He repeated the feat six years later on board the Twiston-Davies trained Earth Summit, an out and out stayer who had already captured the Scottish and Welsh Nationals. His association with Twiston-Davies also yielded victories in the Paddy Power Gold Cup (1992 Tipping Tim), Citroen C6 Sefton Novices' Hurdle (1999 King's Road), Long Walk Hurdle (1993 Sweet Duke), Scottish & Newcastle Aintree Hurdle (2000 Mister Morose), Feltham Novices' Chase (2004 Ollie Magern) and the Charlie Hall Chase (1994 Young Hustler, 2005 Ollie Magern). The Welshman has suffered plenty of injuries during his long and successful riding career, including breaking both legs and his left arm, breaking his collarbone and dislocating his elbow. 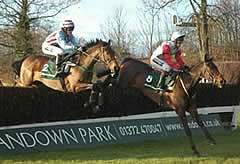 Antony Evans was announced as Llewellyn's replacement as first jockey to Nigel Twiston-Davies in March, 2006. Llewellyn's best ever season as a jockey was during the 1997/98 season when he rode 82 winners. Last season he partnered 40 winners. A classy hurdler, Too Forward won the Grade Two River Don Novices' Hurdle over three miles and half a furlong at Doncaster (Jan, 2002) and finished an excellent seventh to Galileo in the Royal & SunAlliance Novices' Hurdle at Cheltenham (March, 2002). Too Forward was off the track from April, 2003 to November, 2004, when he embarked on a novice chase career, scoring over three miles and a furlong at Folkestone (January, 2005). Last season saw the son of Toulon score once, in a handicap chase at Newbury over two miles and six and a half furlongs (Nov, 2005), but he also produced several excellent efforts in defeat at Cheltenham. He chased home Fondmort in the Unicoin Homes Handicap Chase over two miles and five furlongs (Jan, 2006), going down by just three quarters of a length, and then found only Our Vic too strong on his final outing, over the same course and distance, in the Grade Two Faucets For Mira Showers Silver Trophy Chase (Apr, 2006). He is an entry for the 2006 Paddy Power Gold Cup at Cheltenham on Saturday, November 11. Unbeaten Roll Along is an exciting recruit to novice hurdles this term, having landed his first three outings in bumpers and then scoring first time over obstacles. A comfortable debut success at Fontwell (Oct, 2004) over two miles and two and a half furlongs was followed by nine-length romp over two miles at Fakenham (Oct, 2005), a fine effort after a year-long absence. Roll Along then landed the bumper hat-trick in a Listed event at Warwick over two miles (Jan, 06) on testing ground, showing an excellent attitude and impressive change of gear to defeat pervious winner Spartacus Bay by a length and a quarter, conceding 8lb to the runner-up. He made a very impressive jumping debut at Cheltenham on October 25 in a maiden hurdle over two miles and half a furlong. Always travelling well for Paul Moloney, Roll Along jumped to the front in the Club 16-24 Maiden Hurdle after the last and quickened up in fine style to defeat Ofarel D'airy by a length and a half. A promising youngster due to be sent over fences this term. Snakebite finished placed on his first three starts in bumpers before being out of the frame behind Missed That in the Champion Bumper at Cheltenham (Mar, 2005). He was a good second on his hurdling debut behind Killaghy Castle over two miles and one and a half furlongs at Folkestone (Nov, 2005), and followed that promising run with a six-length victory in an extended two mile and three furlong contest at Lingfield on heavy ground (Jan 06). Snakebite was a well-beaten second in identical conditions over the same course and distance a month later, but rounded off the campaign with a decent fourth behind previous conqueror Killaghy Castle in a Grade Three novice handicap hurdle over an extended two and a half miles at Sandown (Mar, 2006).